This Interview with U A--- describes events occurring near the former Ka Law Myaung gold mining area, Kyaukkyi Township, Nyaunglebin District, in January 2016, including injury by landmine and livelihood conditions in the village. 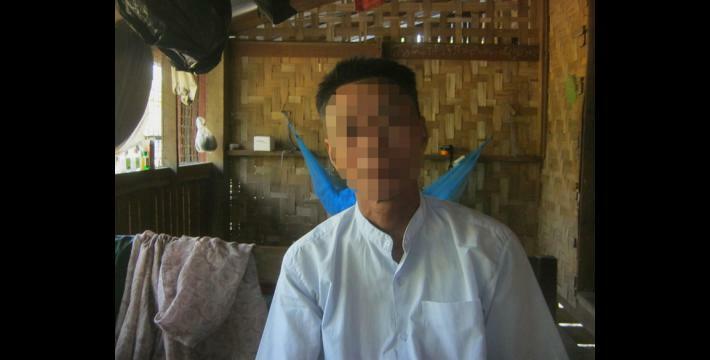 He describes how Saw B----, 27 years old, and his friend Saw C--- went out for hunting wild animals for their livelihood near Ka Law Myaung area where a former gold mining is located. They saw a sign for the restricted area but they ignored it and entered the area. On their second time in the restricted area, Saw B---was hit by a landmine and hospitalised. The following Interview was conducted by a community member trained by KHRG to monitor local human rights conditions. It was conducted in Nyaunglebin District on January 10th 2016 and is presented below translated exactly as it was received, save for minor edits for clarity and security. This interview was received along with other information from Nyaunglebin District, including three other interviews, one situation update and 88 photographs. I live in Kyaukkyi. I was born in Kyaukkyi and have grown up in Kyaukkyi. Is that ok asking you about the village situation generally, and about the livelihood issues in the village? Common villagers’ occupations are plantation farming, also doing odd jobs or random jobs, hill farming, and some villagers do flat-field farming. The nearest estimate number of people who live in the village is around --- [censored for security] people. Most of them are doing odd jobs. For those who are middle-rich, they are about 50 households, and the rest are poor who mostly are doing odd jobs. How many households in this village? Is that exactly [censored for security] households? Yes, the majority of villagers among the households are doing odd jobs. Are they fine with doing random jobs? Some people seem to be able to afford [their basic needs] by doing odd jobs but some people are not gaining much benefit from this. There is no such a good employment opportunities for the villagers. What kind of jobs do rich people do? Most of them are working on betel nut plantations. What is the situation of the village? Some part of the village lands were destroyed by water erosion. In the past we lived over there, but now we have to move to the other side of the river because of the erosion. And we have to buy the land for the plantation and building the place to live. This church has been constructed for more than 100 years and our school has been destroyed and relocated due to its close location to the erosion area. For the situation of villager’s livelihood describing in a five year period, they are just doing the odd jobs. Are there are any human rights abuses in the village? During flooding, the support reached to 64 households, the rest of the remaining households did not receive the support. Including me, I did not receive it, and I had to distribute it myself and help the group who supported the disaster [relief]. Let me explain to you one example of the human rights abuse: villagers were tortured and punched by the authorities or a person who has the power oppresses those who don’t. We do not have that kind of abuses. Also, it is sort of a human rights abuse if villagers are injured by a landmine. Yes, there were 16 people hit by landmines in my village, as you can see there is my brother-in-law and he was hit by a landmine too. They did not use the road as they have to find food for their daily survival [in the forest]. And as they struggle with livelihood so they have to find the food [in the forest]. They even saw the sign that says ‘do not enter’ or ‘there is a landmine’ and even the KNU [Karen National Union] authority remind and announce that [you] do not go to the area but as we are poor and have difficulties with livelihood we have to do it, as the authorities did not support for this one [livelihood issue]. While they went to find the food like this, they were hit by a landmine. How many people have been hit by a landmine recently, this year? Only one was hit by a landmine this year. His name is Saw B---, 27 years old, and his father’s name is U D---. Where does he live now and which hospital did he go to? He went to Mone hospital but as Mone cannot cure him, they transferred to Toungoo Hospital. I heard that they were hit near Ka Law Myaung area where the gold mining was located. Don’t they know that there was landmines planted [there] and weren’t they informed? 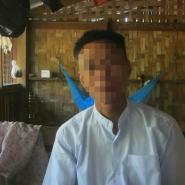 We were told and informed by the local KNU that there are going to be landmines planted [there]. But the first time when they went, there was nothing that happened [to them] and they thought if they go again they will be also secure [safe] so they went again and unfortunately he [Saw B---] was hit on his second time. We believe that it was probably planted by KNU because in the past there was a gold mining project allowed by them [in that area]. Don’t they inform and give any letter to the villagers [about where they plant the landmines]? No, we did not receive any letters; we just heard a rumour spread from the other civilians, we were not officially informed or given awareness of that. How long has it been since that villager [Saw B---] got hit by a landmine? No, it just happened on January 1st 2016 on Friday. Until now he still in the hospital. His right leg fell off and his left needed to be covered with steel. He was the only one hit by a landmine. Who sent him to the hospital? His parents and some other villagers. How far is the distance between here and the incident place? The estimate is about 5 miles but I do not know how to say [how long it takes] in hours. They went out for hunting the wild animals. How do you think based on this, as a --- [position censored for security]? I do not feel good about it as they were hit by a landmine like this, I also cannot provide anything to the victim. They have to struggle about it as they have been there once and nothing happened so they thought that nothing will happen so they went out again. We do not feel good about it but we could not help them [with] anything about it. What is the plan as --- [position censored for security] for the future to prevent this kind of incident to not happening again? Personally, especially in the area where villagers are looking for the food, if they do not plant the landmine, it is the best. If villagers are free to travel it will be great and we do hope that kind of dream will be fulfilled. What is the purpose of planting the landmine? As I know in the past, there was a place where a gold machine [site] opened. They were forced to shut down due to security reasons and they were worried that the villagers would go and look for things there. They gave an amount of time for those who did mining there to move their materials out of the area but although some of the people did move out, their machines were still in the place during [after] the given time. What do you think as a --- [position censored for security], will that kind of thing happen in the future again? For the villagers as they face difficulties with their livelihood, they will still go out to find food to survive and probably this kind of incident might happen again. What is your thought as a --- [position censored for security], to prevent that kind of incident from happening again? Personally, if they do not want villagers to go out to find food in the forest, the relevant government and recently elected [Burma/Myanmar] government should be involved and find a way to improve villagers’ lives and create job opportunities for the villagers. Do you think you can go and directly talk to the person who planted the landmines? Personally, I think there will not be an immediate action taken in the process even though we talked directly to them because we were allowed [to talk to them] only when invited [by them]. As a small village from a rural area, I do not think that they will consider or listen to our testimony even though we say, ‘don’t plant the landmine, it injures villagers’. And one thing: if we actually go, they will just respond like, ‘if the civilian did not go [to] such [places], this accident might not happen and we planted the landmine to protect the area only’. Did you mention before that there were 16 landmine victims in the village? What years were they hit [by landmines]? We do not have the exact date of record, some people they were hit by landmines since the ‘four cuts’ period and some are recent. There were even three of my family members injured by a landmine; one was my niece and two of my brothers-in-law. What is this village called? In Burmese we called as C--- village and in Karen we called as Cc--- village. Has any other organisation [humanitarian aid group] arrived to your village? No, the only organisation that arrived was the group that explained about the dangers of remaining or unexploded [UXO] landmines. This group are from the [Burma/Myanmar] Government side. What did they do during their visit? They came and explained about how the unexploded bullets or devices and any other form of weapon should be avoided. They will come again at [location censored for security] this month on February 20th 2016 and one foreign English person will be included. Do you know who are they or which organisation they are from? I do not know their name; this time when they come there will be one foreign English person who will be included. They just demonstrated like, if you see any strange device do not fool around with it, instead mark the location and count the distance between your current stand and the place where the device is located then come back and inform the relevant responsible person. Did you not wonder why I am conducting this interview with you? For me I do not think anything, I just feel that it was good to share information with you. Do you want to say anything else that I have not mentioned? I do not have anything to say as you have already covered [everything]. However, as a suggestion for the current new [Burma/Myanmar] government, they should also consider to solve the problem regarding the remaining old landmines or new landmines that were planted, to reduce the fear for villagers to travel freely. Thanks for your time and answering the questions.